Birthday present shopping took me to Norwich this morning so i boarded the X1 from Acle and headed for the city in glorious sunshine. All good apart from the fact the words "Bright Sunshine" and Norwich do not mix well if you have your camera with you as very few places are good for photography in the winter months. Nothing unusual to report apart from seeing 37562 FJ08FYN with a smashed destination screen in Castle Meadow, this quickly headed off out of service back to the depot. 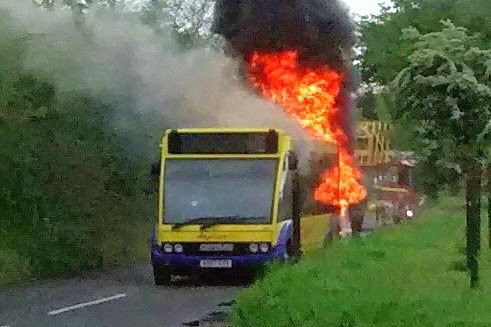 Yarmouth to Norwich services were affected quite badly due to Haven Bridge becoming stuck in the morning, my return trip was put back about 50 minutes due to this and a couple of X1 services were noted heading through Filby en route to Acle on my way home. Finally i would just like to wish all our readers a Safe and Happy New Year and to thank Roy for letting me become part of the blog and also a special mention to Jim Long for his help and information from the Ipswich area plus thanks to Danny Beales & Chris Speed at First for their continued support and friendship. And to everyone elso who has helped me this year along the way! 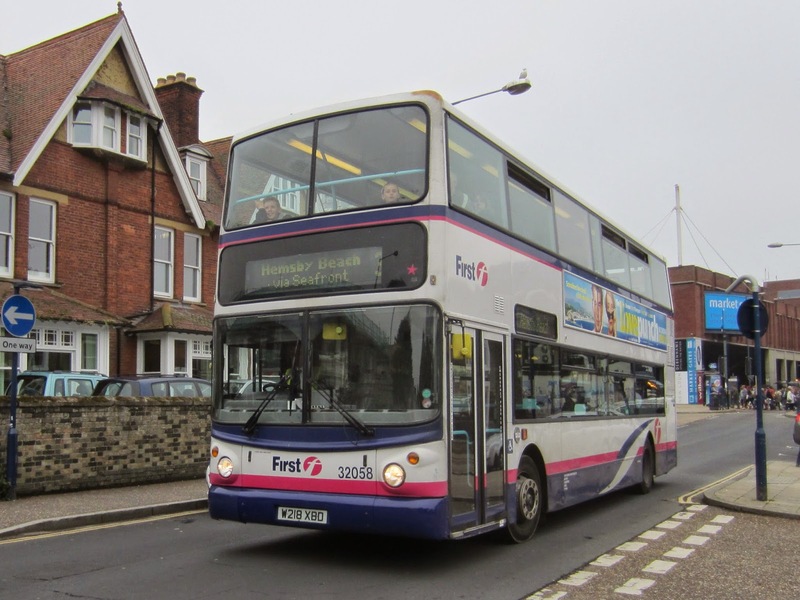 Similar to the fate of our First Eastern Counties X1 route, the Coastliner has also been split into three separate parts from May this year. 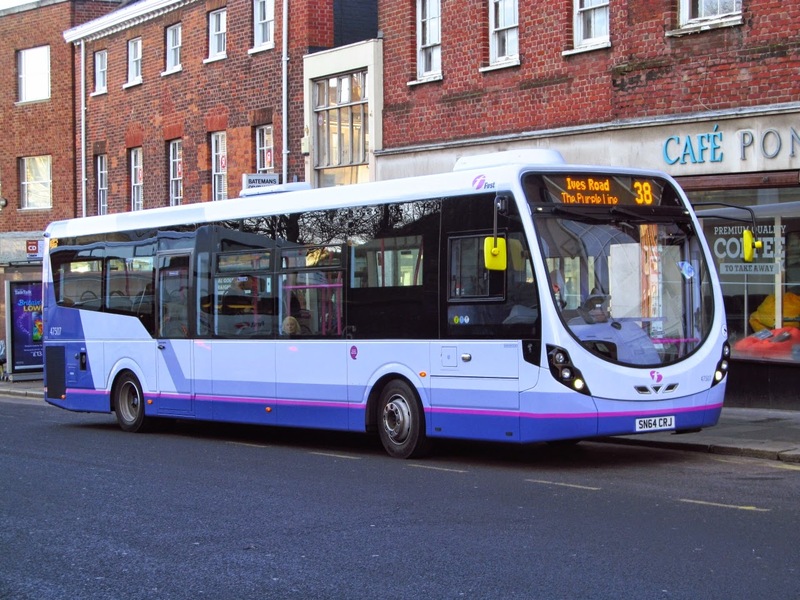 The first part runs between Brighton and Littlehampton with another Coastliner running between Littlehampton and Chichester with a third between Gunwharf Quays, Portsmouth and Felpham Park. similar W825NNJ. 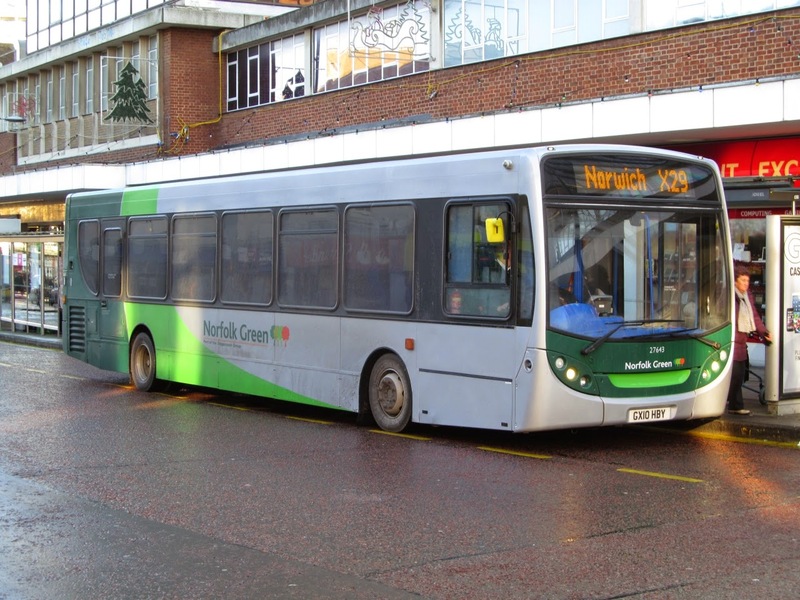 A further Anglian liveried example, T813RFG, was withdrawn the following month with Konect again supplying W822NNJ and W823NNJ. On the Volvo Olympian front the numbers in service at the beginning of the year were at an all time low with 34109 W436CWX taken out of service for repair. At the time both Northern Counties variants 34186/7 S686/7AAE were continuing in use on schools and contract work. The remaining active examples saw periods in and out of service as parts were being robbed from others stored at the back of the depot. Spring saw the numbers increase with the return to service of 34111 W431CWX and 34114 W434CWX. Unfortunately not all have them have made it to the year's end as 34187 S687AAE left in October for scrapping after yielding its gearbox to 34186. 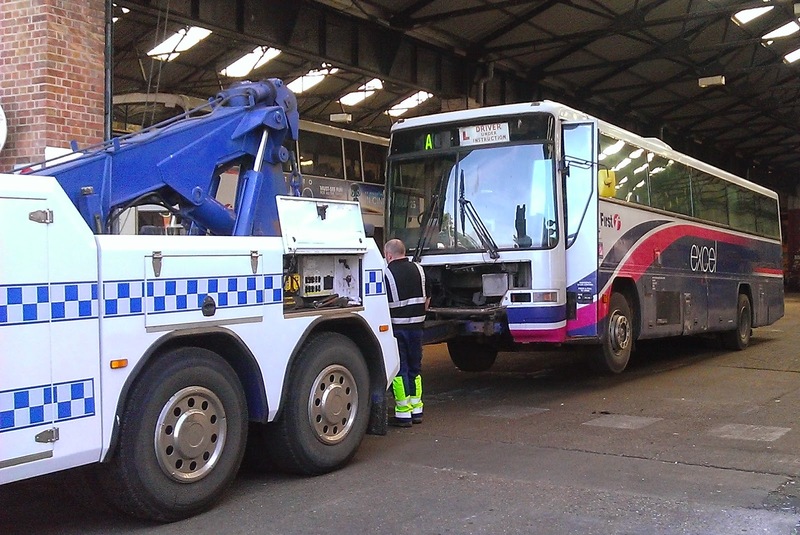 Lowestoft's 34155 P655UFB was also collected by Alpha Recovery, although sister 34156 P656UFB was donated to Norfolk Fire Service. Repaints also formed many of the reports on the blog. 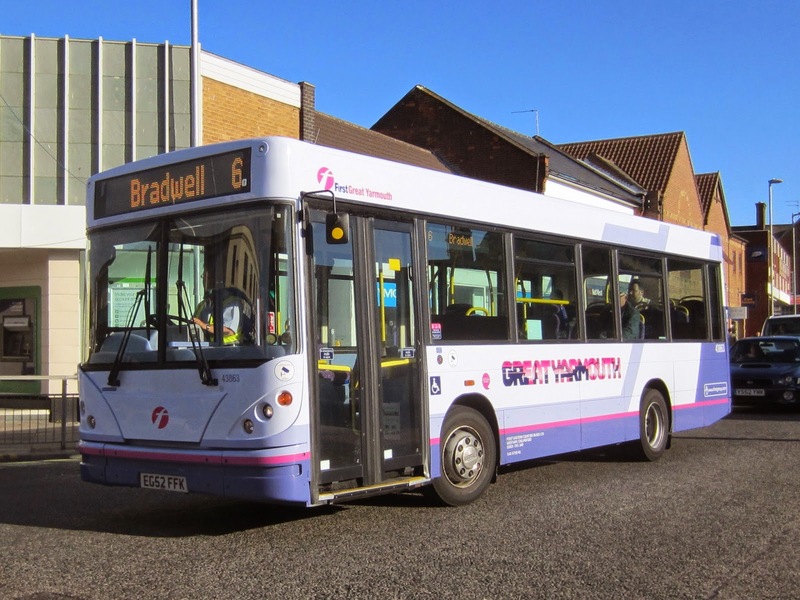 After its use on X1 services in January celebrity 33423 SN60CAA moved to Great Yarmouth and was sent to Full Circle for a repaint. It returned in early February and straight away attracted the attention of photographers. However, First reported later in the year that it was to be repainted in the blue/gold Excel X1 livery which clearly upset some enthusiasts! Gemini 37578 AU58EDJ has been subsequently subjected to the same treatment. 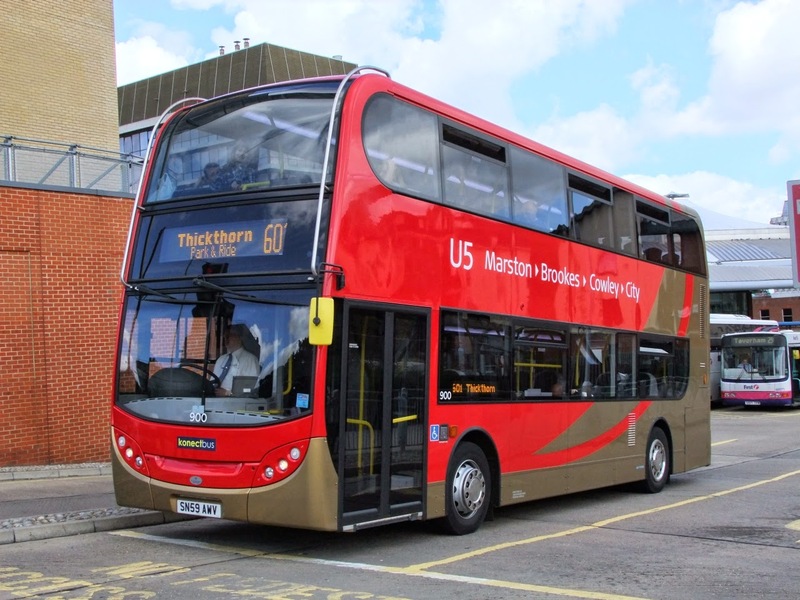 With Ipswich repaints already under way, Norwich jumped on the bandwagon in September with 33163 LR02LXZ being the first to return in its new livery. 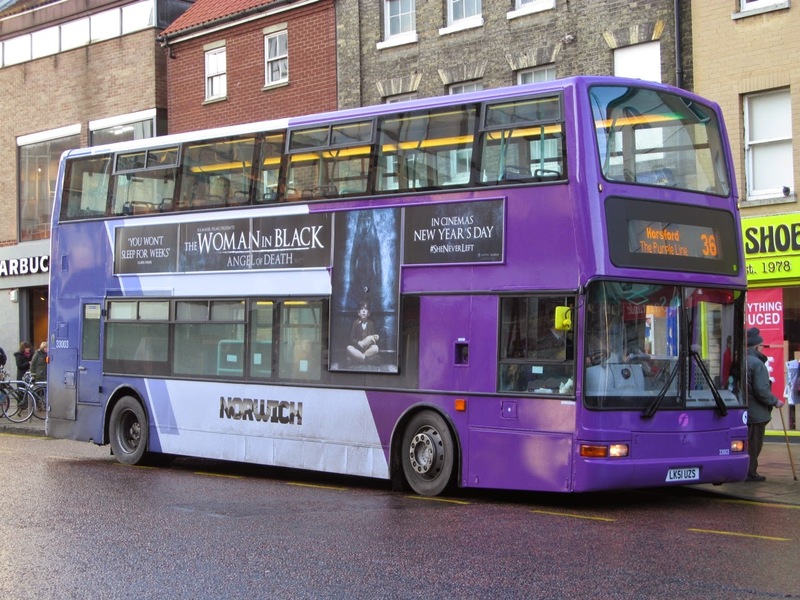 There was some confusion though over what size and colour the Norwich fleet name would be in! My thanks also go to James Race, Neil Chilvers, Tim Major, Joe Leathers Watson, Danny Beales, Chris Speed, James Long, Lee Howes, Rob Collins, SteveW, Terry Wilkins, Zak Nelson, Mike Sayer, Harry Stanley, Sam Larke for their support too. My apologies if I have left anyone out! 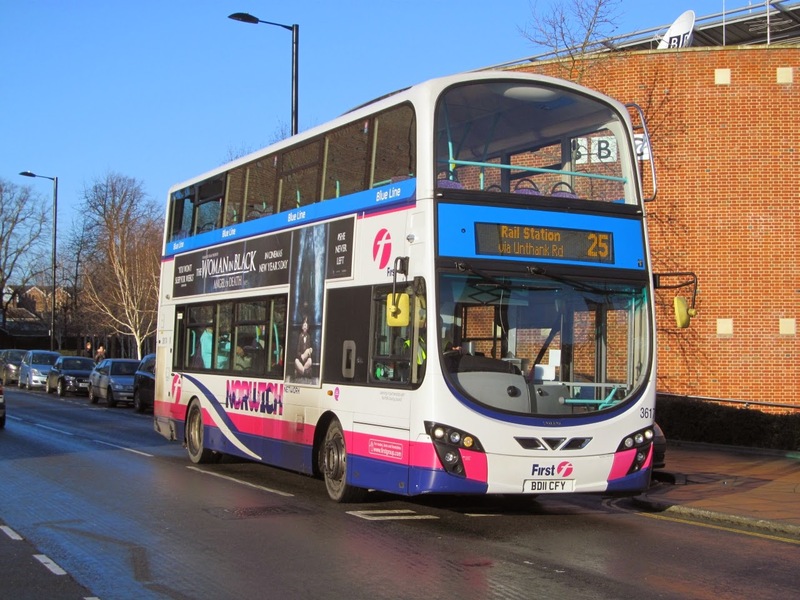 With Christmas getting ever so closer, it is the time of the year for the blog to reflect on the major activies on the local bus scene over the past twelve months. The blog itself has seen many milestones passed this year - our 1,000th post in April; the 400th post this year in October and not forgetting the half a million visitors to the site! However, the holiday never materialised due to illness! The positive side of it was that Grahame was now able to create and submit his own posts to the blog. What a tremendous help and asset he has been. Many thanks Grahame for your valued support during the year! 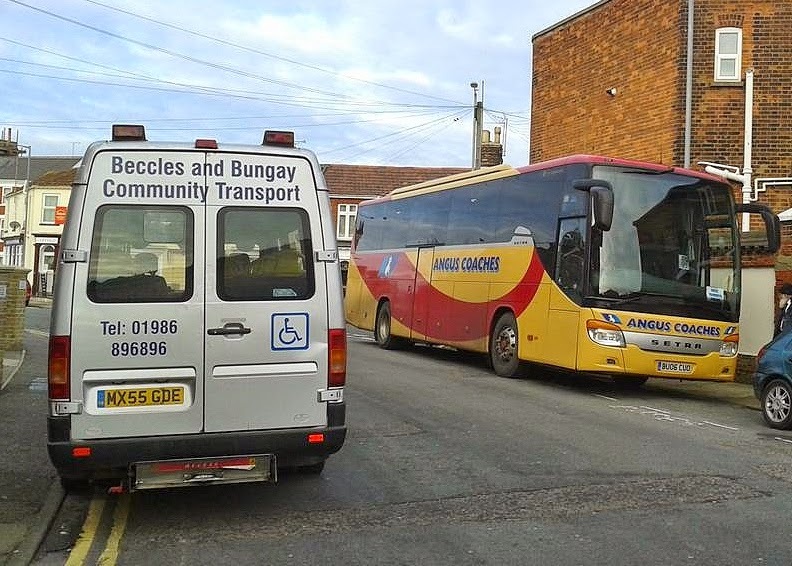 As already mentioned some vehicles have left the fleet - Javelin P109WJU to 3D Travel, Cumbria; Volvo N962DWJ to P&M Coaches in Essex and 491JVX to Our Bus in nearby Acle. There were five Dennis Javelins in the form of V671FPO, Y334YUT, Y327YUT, Y339YUT and Y335YUT. 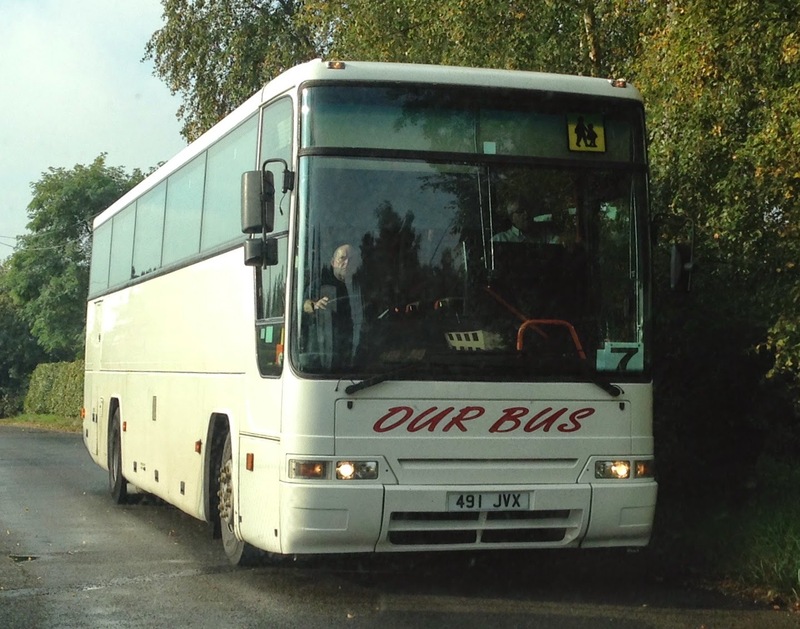 The other vehicle was Volvo B10M/ Plaxton Panther W172VEL. Pantomime Season ~ Oh No It Isn't! 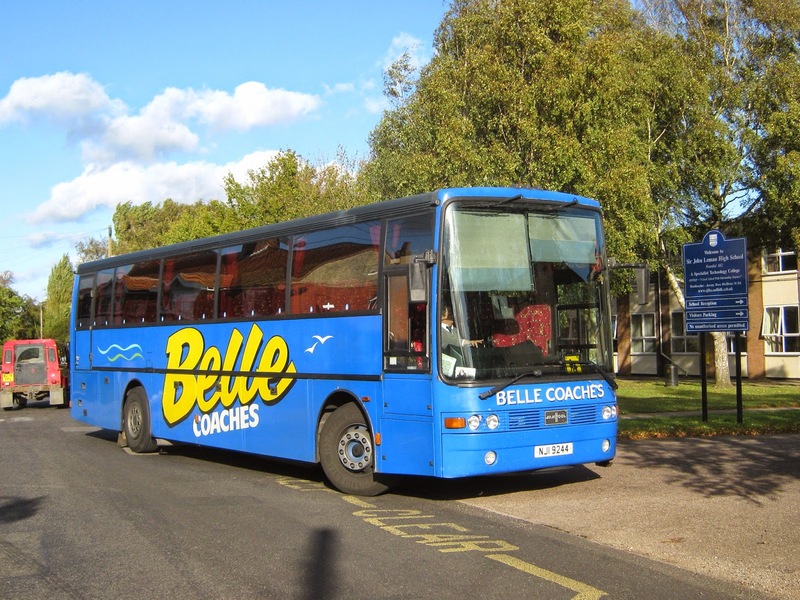 The Norfolk coach was YJ55EZE - a Volvo B12B/ Van Hool with Dereham Coachways. 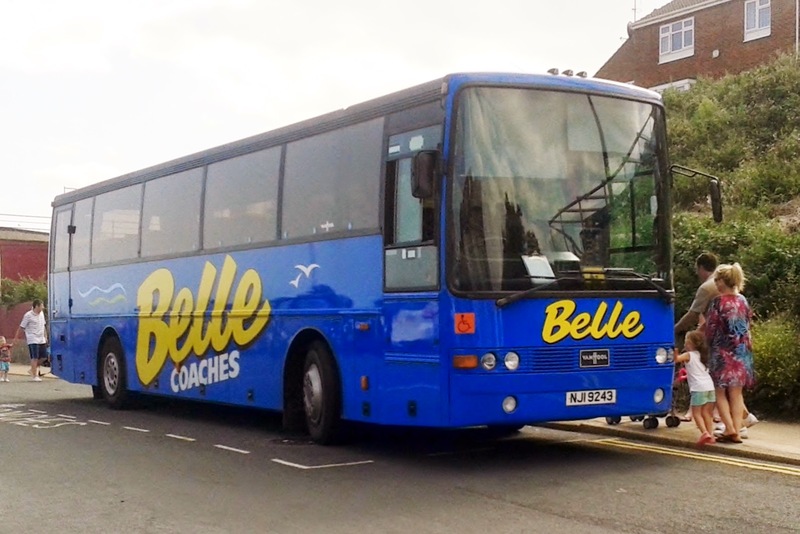 Regaining its old registration, B415DHK was sold on Shreeve of Lowestoft (Belle Coaches) where she received fleet number 31 and another registration SIL9044. This is not to be confused with the present holder of that registration and fleet number which is a Volvo! 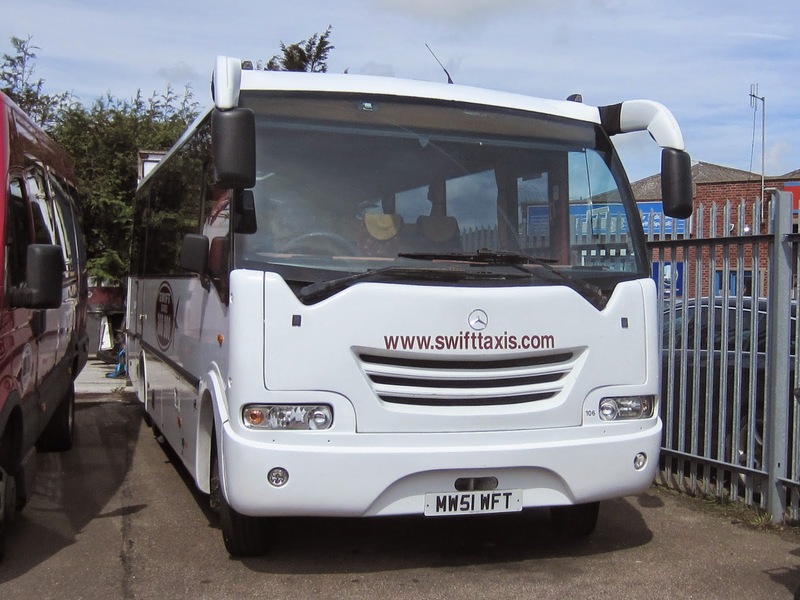 R334RCJ was acquired by Swift Taxis in December 2009 following the acquisition of South Burlingham based Amza bus company. With Swift the Dennis Javelin received fleet number 135 and the name Swift Gooseander. 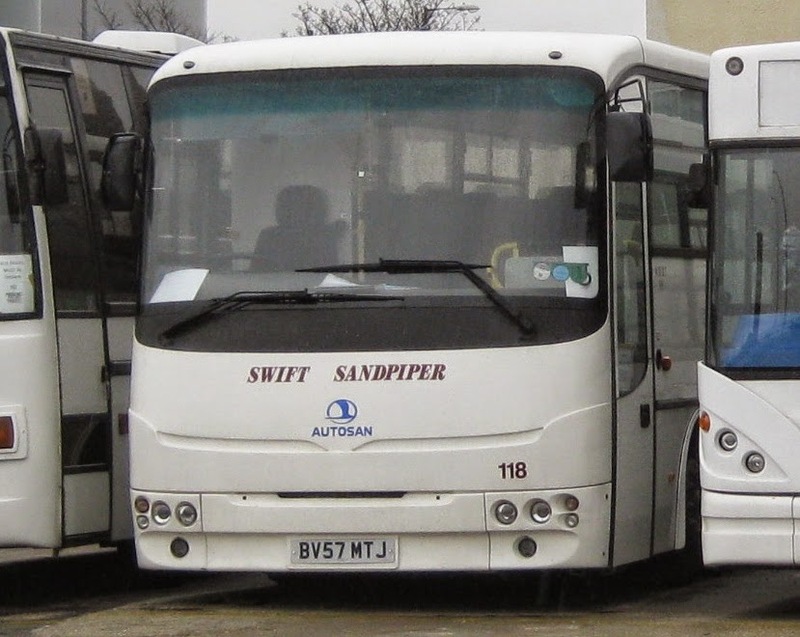 In August 2011 Swift held an auction of over 10 of its buses and coaches including R334RCJ, when she was subsequently sold to Tees Valley Coaches. 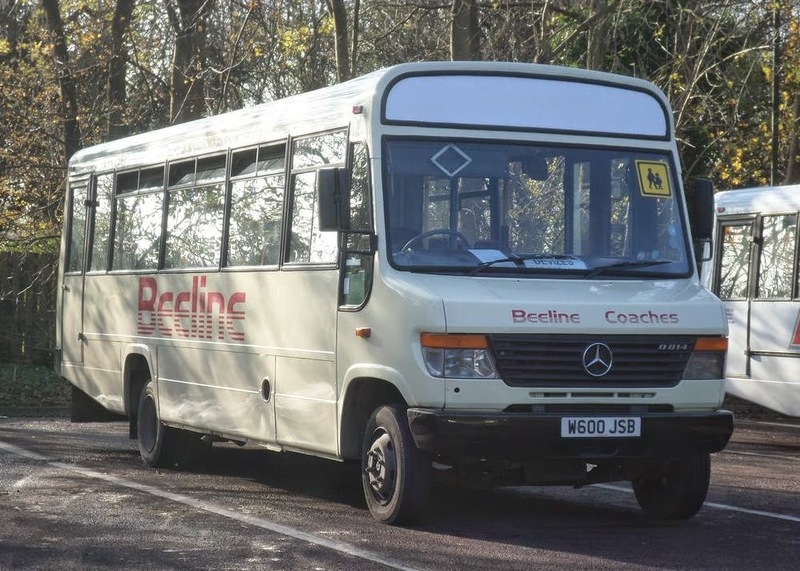 There she received a much needed refresh and had a re-body and repaint which meant she finally lost her mountains logos which had been retained on the sides since with her original owners Whittle when new in 1997. Unfortunately in December 2012 Tees Valley went into administration and R334RCJ can now be found in Wales with Wilkins Coaches. In the picture she is seen at her new home at the Wilkins depot in Wymmer in Wales. Picture courtesy of Plaxtonpointer2 on Flickr. 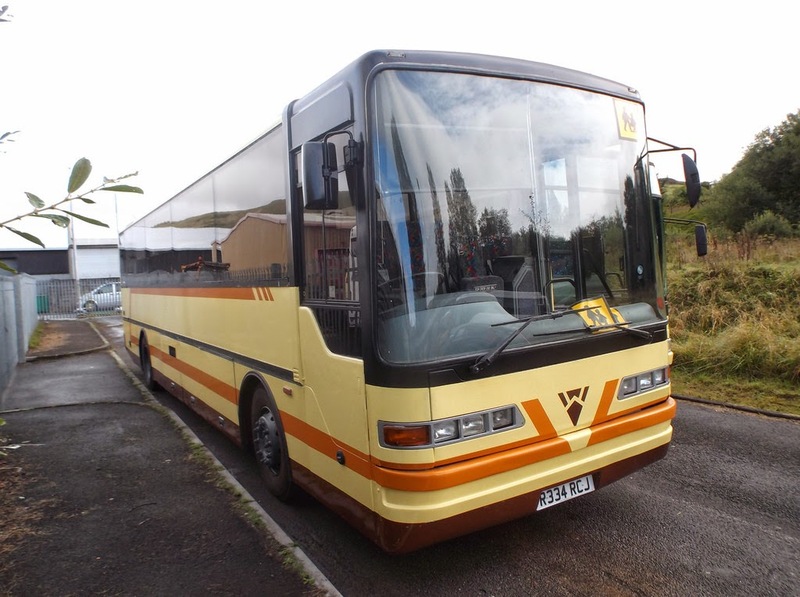 New to Coakley Bus of Motherwell in March 2000 as W60CBC, the 31 seater was re registered in November 2006. 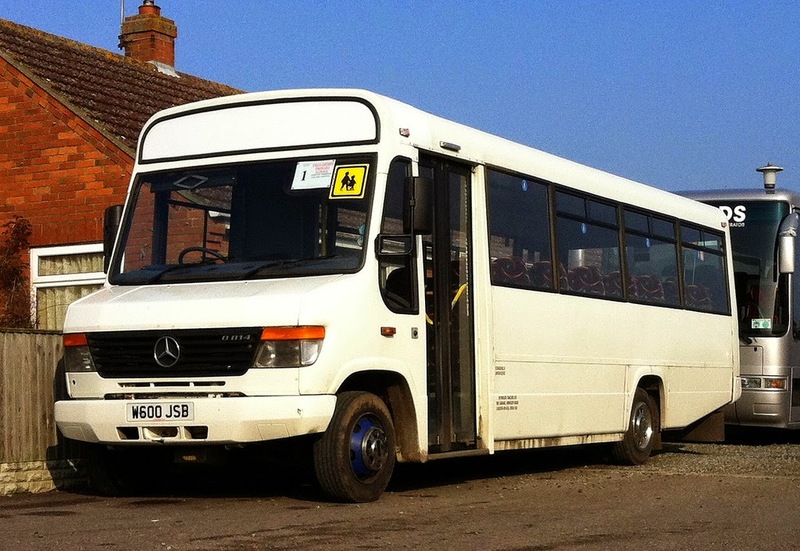 Reynolds obtained it from Whitegate Travel of Anderton in Cheshire in January 2012. Before that it was with Pickford of Chippenham in Wiltshire. Each year Great Yarmouth's Hippodrome Circus puts on its Christmas Spectacular Circus and Water Show attracting visitors from far and wide - well Suffolk anyway! A quick trip to Norwich this morning to catch up on recent arrivals and repaints, unfortunately the winter sun put paid to decent photographs but I did manage a few! 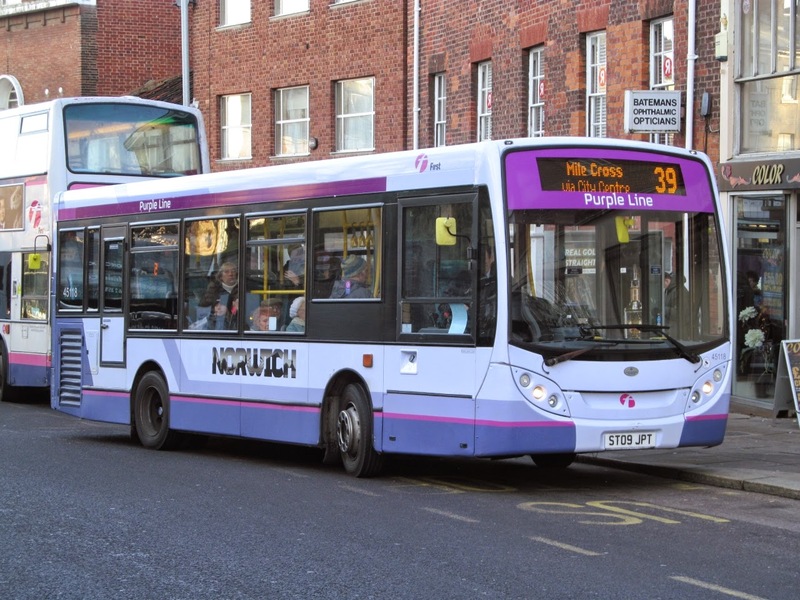 First up is newly repainted 33237 LT52WVF seen in Castle Meadow working the 37 service to Mulbarton. Recent arrival from Lowestoft, 45118 ST09JPT has quickly gained Norwich names and also Purple line branding. Last up is Streetlite 47507 SN64CRJ working Purple line service 38, others were noted on various routes across the city network. Repaint situation at present sees 33003 LK51UZS returning from Rotherham yesterday with 32203 going the other way whilst 32100 is currently at Simon Morris in Ipswich. 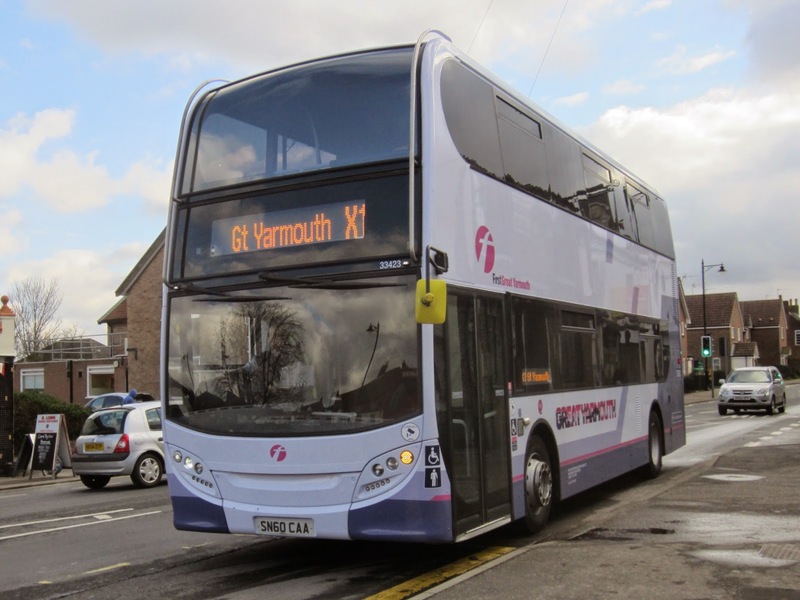 With all the recent excitement over the arrival of First's new Streetlites at Yarmouth & Norwich taking centre stage in the blogging community i thought i would move away from the current news and take a look at a certain vehicle in particular that has had a very busy time of it since being introduced and the fact it has a few links to our area. 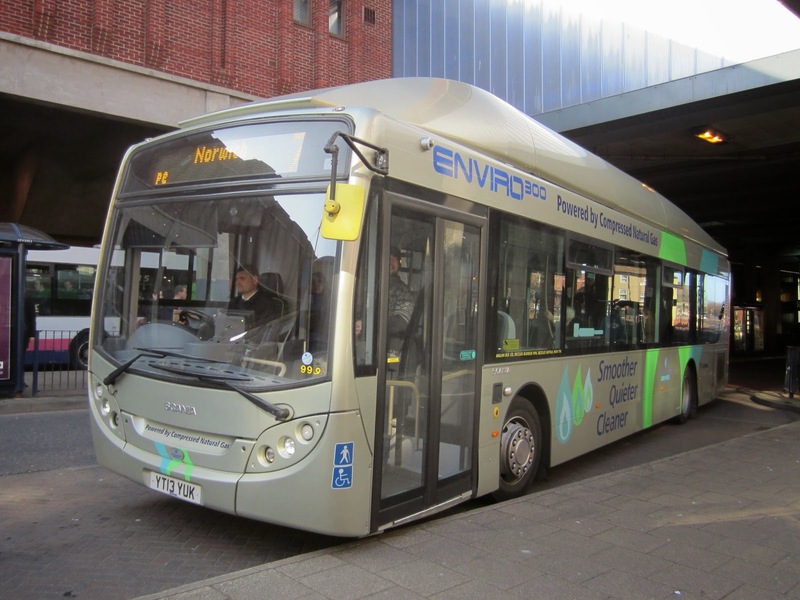 SN59AWV is an Alexander Enviro 400 which began life as a company demonstrator back in 2009, it was built in 2008 but was not registered until September 2009. 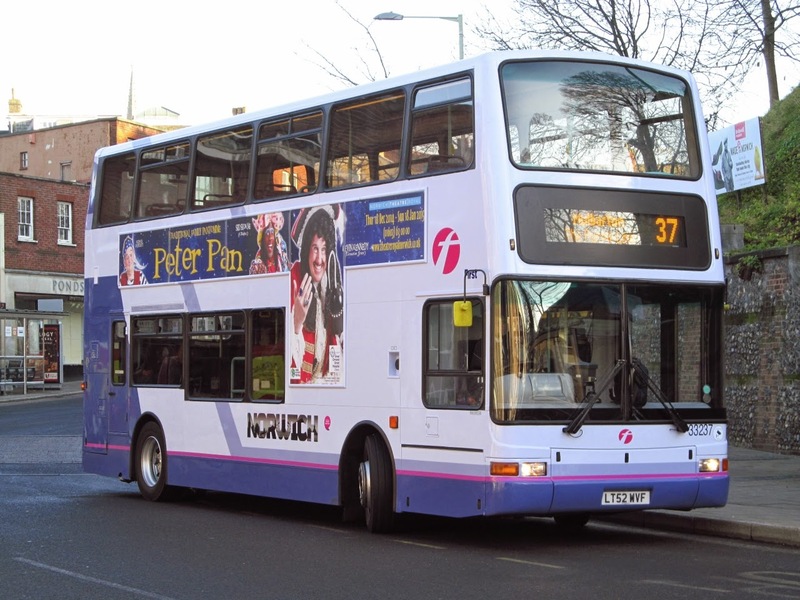 It began a life of touring the British Isles being evaluated by various operators and first stop was JP Travel in Manchester where it gained fleet number 651. It then ventured back up to Scotland and spent time with Mcgills in Glasgow as their 901. 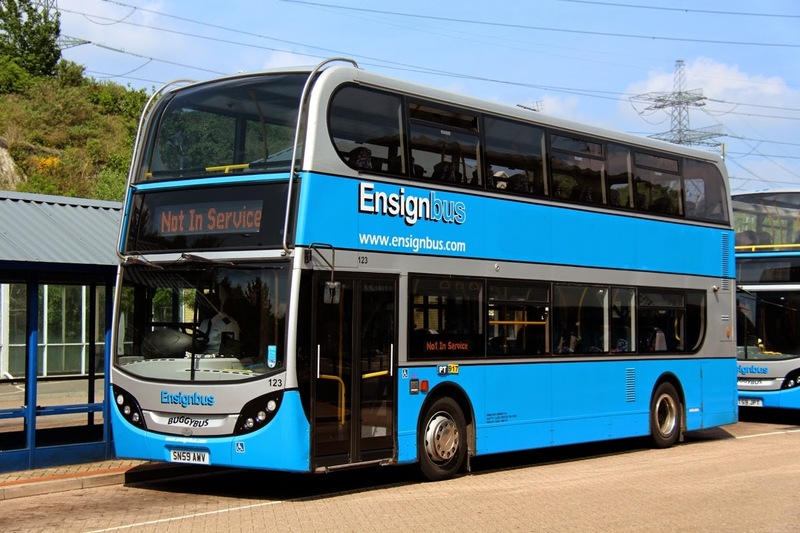 A move back to Essex in 2013 saw SN59AWV gain the striking livery of Ensignbus and she was to stay in Essex when purchased by Firstgroup later in 2013 alongside two others of the type, VT59JPT which is now 33424 with First Essex and of course our very own 33423 SN60CAA which is Yarmouth's most popular vehicle at present!. 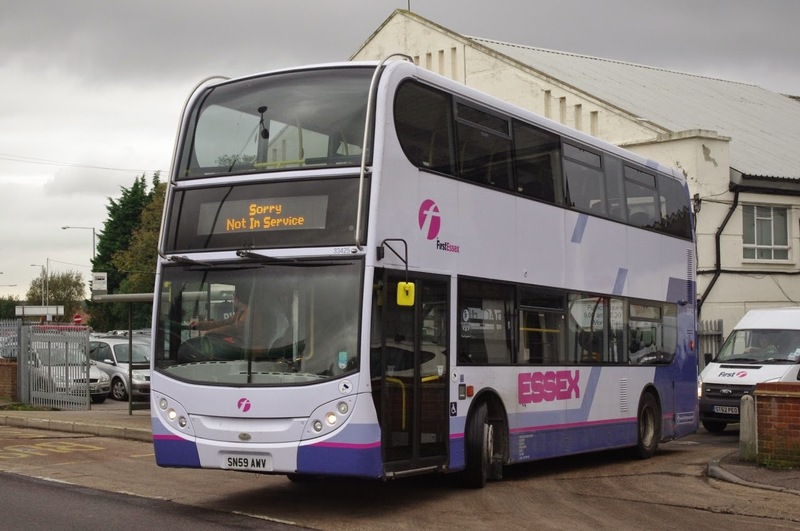 SN59AWV became 33425 with First Essex and is currently based at Basildon Depot. 43863 EG52FFK travelled over the border last night and is the third of Great Yarmouth's former Jersey vehicles now in service in the Suffolk town. Going the other way was Dart 42921 EU05AUN which has returned to Caister Road on loan from Lowestoft! Regular contributor Jamie Skinner sought approval to access the interior of the decker which is still located just off High Road. 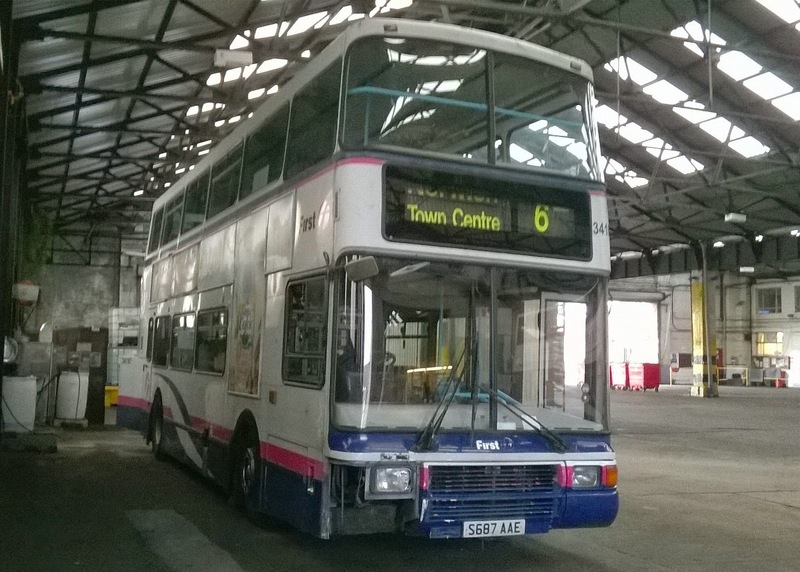 The first impression was that the bus was still in reasonable condition despite being withdrawn and laying around for almost a year! In reality the seats upstairs had been cut out with an angle grinder with several poles removed, one smashed flat and cut off. Additionally the side destination display enclosure had moss growing inside it and was rotten plus the upstairs front window appears to have let in a lot of water with the surround also rotten.